I understand that people want to make money blogging – I really do – but some ways of monetizing are just VERY bad ideas. Every day I see a beautiful blog post that I would love to link to or share – but I am stopped cold because the blog features one of the methods mentioned below. Example of the WORST PLACE to put ADSENSE ads. affect whether your posts are linked to or shared. Flashing, talking YOU HAVE WON banner ads are the worst. I was surprised to find that the one that blasted me today appeared to be a Google Ad – but wasn’t. These just scream amateur, scam or desperate – or all three! They make your blog look like a MFA (Made for AdSense site) only created to make money and not a real blog. Very bad for first impressions! If I will not link to or share your posts I bet there are other bloggers who feel the same way. You can not measure the loss of traffic (and therefore income) because other bloggers avoid sharing or linking to your posts. Why would you want to send visitors away BEFORE they read your blog posts? I am not saying never use AdSense; I am suggesting that if you want others to take your blog seriously, position smaller ad blocks somewhere we might actually want to click on them such as in the flow of the post or my personal favorite at the bottom of the post. AFTER I read what I came for then – and only then – will I click on a related ad. Your readers are highly unlikely to remember to scroll back up to the top to click on an ad they may have noticed before they started reading your post. For a better way to locate AdSense on your blog posts check out how WordPress expert Justin Germino of DragonBlogger uses a smaller block of two AdSense ads between the title and post and a large block at the bottom of the post. I was moved to write this blog post when someone shared this unique house architecture post with beautiful photos that would be perfect to link to and share with followers of the Good Millwork architecture blog – except for those ads. 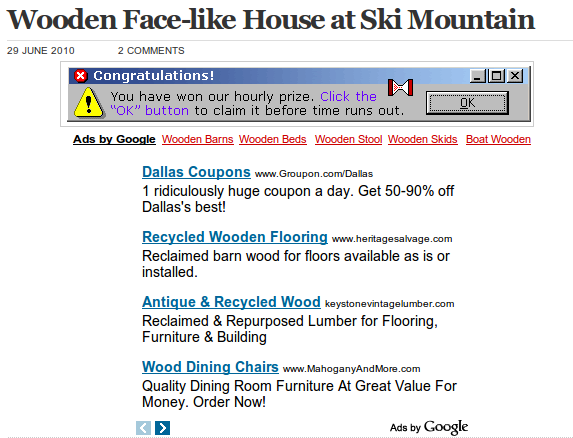 That blogger gave credit to another source so there was still a chance I could share these ski house photos – until I saw that blog also has that giant AdSense block at the top of the post. At least it doesn’t have those awful flashing “you won” ads or the talking one that I missed capturing but I’m sure you’ve heard before. Maybe they’ll see the trackbacks, decide to remove those detractions and let me know. content and photos but not those ads! Kim is blogging coach and mentor and is starting a Tribal Syndicating Blog Alliance Team that is very similar to plans I have for our Secret Blog Club blogging collaboration. Knowing whose advice to heed is key to becoming a more successful blogger and is especially essential when it comes to making money online. The best way to find out who teaches ethical methods that work is to take the shortcut – ask experienced blogging mentors who are already successful. I don’t want to earn money on my personal site..
No? Then why are there AdSense ads on the site you linked to from this comment? Are you referring to a different site? I certainly strongly agree, Gail – and now that Google made “excessive advertisements” a part of their measure of the quality of a website, I hope it makes many think twice! Yep, sometimes people spend so much time trying to squeeze out every bit of money out of adsense that they lose the long-term perspective. Agree! I really hate the pop up ads. Well I can say this is a very interesting post. I pretty much agree with everything you said. I actually find myself guilty of doing two of the things mentioned in the past but I don’t do it anymore like the adsense underneath the title. While I did make more money that way, I thought it took away from my blog so I stopped doing it. In any case, I am going to read some of your other posts to see what all I can do to better my blog. I completely disagree because I think it is up to the blogger on how they want to promote, I personally dislike promoting affiliate products, I hate sales pitches and trying to convince people to part with their hard earned money is just not something I enjoy doing. That being said I will occasionally promote a product I like and think will do well for others, but I must have used the product first myself. For people who don’t want to directly sell or try to “convince” people to buy pitched stuff or they have no product to sell themselves, AdSense and other CPA like Amazon Affiliate banners…etc are good ways for passive income. The other thing is remember than many people arrive to your blog via search engines and some may not find the article they were looking for, those tend to click on a banner between post content and body because they likely didn’t find what they were looking for in the article to read it to bottom anyway. Since adding a top banner on my site I did double my AdSense earnings over the last few months. Could I make more promoting an affiliate product (probably) but I just would prefer the passive click to catch passerby’s. Ideally I wish I could get some sort of contextual Amazon banner that changes products based on keywords in articles like AdSense, I think this could convert better than AdSense but there is nothing that I know of to accomplish this. I should have clarified that I disagree only with the part about affiliate marketing instead, I do agree that flashing banner ads and popups are revolting. I think a relatively unobtrusive banner however is acceptable. Thank you for taking the time to comment. I believe Affiliate Marketing has a bad reputation because so many affiliates have been promoting whatever makes the most money instead of what they actually use. As more bloggers like Kristi and I post about the importance of ethical recommendations I hope that reputation will change. The narrower box of AdSense ads that you are using on your site is not what I meant. Your content is visible above the fold so it is obvious there IS a blog post on the page. It is the ad box between the title and post that fills most of the space above the fold that I feel is too much. For those who want to use AdSense ads, those large ad blocks are ok positioned elsewhere the way you have them on your posts. I like the narrower line of AdSense ads even better than the two ad box you use and think more ads will fit. That might increase your AdSense income further. It has become clear to me that we must focus on promoting small business and stop handing everything to huge companies so I am not going to use AdSense. I did earn about $400 a month from it on a static site I built years ago but am going in another direction now. Bloggers could use these types of monetization techniques while they are getting established and then replace it with more lucrative advertising later. Based on how much Amazon Affiliate I am converting, I would ditch AdSense in a second if I could find a way to make a scripted Amazon banner show targeted products related to what I write about, SEO books when writing SEO articles, movies when writing movie reviews….etc the affiliate earnings would be worth 5x what AdSense earns because of the cookie and cross product referrals. As I have a wide skyscraper I can’t put more than 2 banners in post, I originally had banner at bottom (468×90) but it didn’t convert nearly as well as the 350×250 I have now which is still the largest earning block. One note, I increased my AdSense earnings by using Google DoubleClick for publishers to display AdSense instead of just AdSense alone. I know you aren’t a big fan of Google, but so far I have been happy with AdSense, if I got banned which may happen at any point and without any reason I will have to find something else if I don’t find something sooner. I am not a fan of Google because they are intentionally putting small businesses out of business and not patronizing small businesses instead of multi-national corporations is what is destroying our economy. If something makes us money in the short term but drives the majority of people into poverty in the long term we are as much to blame as they are for what happens to us all. Good to know the 350×250 ad block converts best because the redesign Derek and I are working on for this blog is to add a 300×250 banner rotation in the right sidebar. I will only put products and services in it that I personally recommend and the ads will be generate affiliate commissions. I wrote about that in my newer post How to Monetize Your Blogs. Explain to me more why you don’t like affiliate marketing for monetization. I’m always confused when I hear bloggers say this (and I hear it a lot). Why not promote things like books and movies or even Aweber or Thesis or other tools that you use on your blog? All of those would be affiliate marketing. I am not trying to be argumentative. I really do want to understand why bloggers prefer the random Adsense banners over specific merchant banners. In either case you are wanting people to spend money. If people don’t spend money sometimes when they click on the Adsense banners, companies will stop advertising through Adsense because there would be no ROI. Okay, I should clarify: Some affiliate marketing I actually do think is good, Aweber, Mailchimp, Amazon Affiliate stuff…etc. I mean that most affiliate marketing where the landing page is a single revolting sales pitch with a “I got rich so you can too”, or this plugin helped my site get 1000% traffic increase are the types of affiliate marketing I refer to and dislike. An example is I truly believe in the Roku XDS device, I got one for Christmas and love the Netflix streaming, features and channels. So I created a special Amazon affiliate banner ad for it on my homepage, I sold 3 Roku’s via my affiliate last month (only $12 commission) but still I think its a great product and didn’t mind advertising it. I know some affiliate bloggers who pitched an SEO guide and thought they were going to make big bugs until most of the people who purchased had returned and got refund, so sales converted into no income due to returns, which is why I stress believing in a product if you are to promote it. Also, I don’t consider putting a banner ad up on a page (affiliate per se), in my mind affiliate is where you write a post specifically promoting the sale or attempt to convince your buyer to purchase a product. Affiliate promoting is the building a mailing list only to offer them products at great rates that will expire in 14 days if they don’t purchase it. In my blogging journey, I care more about having fun, keeping a decent reputation and conversing with my readers rather than trying to pitch anything for a buck. I don’t make nearly as much as I could, but I take pride in that. With that being said, for those who blogging is their primary and only source of income, business is business and kids gotta eat and you have to have a roof over your head so I don’t particularly badmouth anybody, I just don’t have to do the same thing. Gotcha! It sounds like it comes down to the definition of “affiliate marketing.” At Affiliate Summit and the other affiliate conferences that I attend, there is VERY little talk about just putting up splash pages and building lists to sell download products or things like that. It is a part of it, but not really what most of us focus on. It’s a lot more about banner ads, monetizing blogs, product reviews, etc. In fact, I would say that most of my friends in affiliate marketing are promoting through blog sites, coupon sites, and datafeed driven product sites rather than the method that you don’t like (and I don’t care much for either). And as for the Roku…we have one and I just gave my husband a second one for his birthday today! Great product to promote especially in light of the new Amazon Prime free streaming membership benefit. Thank you both for adding so much to this discussion. I believe that Justin’s ethics are very similar to mine and all the other bloggers whose Twitter and BizSugar links are in my Small Business Advice post. We only believe in ethical affiliate marketing and only recommend what we actually use. I totally agree. If a blog, website or any page has tons of ads/popups I do not promote or comment on the page. I do not visit a page to get bombarded by ads & popups. Thank you for taking the time to comment. Bloggers need to hear from many on this issue so they can get a better idea what works best. I really do appreciate it. I find the flashing you have won ads very annoying. I know there are some who fall for it, but c’mon how stupid am I really? Well, there must be at least enough people who actually believe they won to keep them spending money on these annoying ads! The worst thing to do when trying to monetize your blog is to use pop-ups. They absolutely annoy the heck out of me which isn’t a good thing. You should be doing the opposite. I regularly visit some blogs that use popups to build their mailing list. I close them as fast as they come up and couldn’t even tell you what they say. While they probably DO work they are extremely annoying. If a bloggers wants to use these they at least need to be setting a cookie so that we don’t see it every time we visit the page. Ideally only those who are NOT already subscribers should see those popups. It’s unnerving to try to read a blog littered with ads. I understand the desire to monetize your blog, but as you said Gail, you don’t want people turned off before they even read a post. Subtlety is key when using advertising on your blog. Thanks for commenting. Eventually bloggers will find a balance that works. In the meantime, I wrote this post because I want bloggers to know that while they may slightly increase their AdSense income that will come at the price of less traffic overall and lower visibility – and those two things in the long run will affect how much their blog earns overall. I hate ads that open pop-ups, or even if its newsletters subscription, its like a bit desperate, especially if it says “are you sure you want to leave this site”, erm..yes I am. I love your comment and even shared it on Twitter. That is exactly how those “are you sure you want to leave” pop-ups affect me too. Yes, let me out of your ‘pop-up hell’ and confusing “which button do I click to get away you” options the fastest. I checked out your Twitter account and the only reason I didn’t follow you is that I can’t speak Swedish. The link to your blog in your Twitter profile doesn’t work because it is trying to go to .com instead of .se so you’ll want to fix that. You may want to read the post I’ve put in CommentLuv in this reply because it explains how to use KeywordLuv to build incoming links to your blog. Also read How CommentLuv Grows Businesses and Blogs. If some bloggers will not approve your comments or unlink your site it is because they can not read Swedish, don’t know how to translate it or don’t have time to do that and are concerned about what it may say. Please do not take it personally. I can tell it is a real blog and will approve your comments and links here and in the other blogs I manage. Thanks for stopping by my blog and leaving a comment. Very nice of you. I myself am guilty of having ad sense block between title and post. And the truth is I am a newbie (started the blog last year with no knowledge of html, blogging or hoe to even install wp. So, I like most people followed the advice of other so called gurus. As of now, I am trying different positions to find the best spot. Thank you. Check out the update I just made in this post about how Justin Germino @dragonblogger positions his AdSense. If you’re going to use it what he is doing is good example of best practices. Looks like I missed this post when it was originally written but just saw it come across on Twitter. I think that people that that Adsense is “unobtrusive” and therefore doesn’t turn people off. But your example is a great one! Too much and too obvious Adsense might make you some quick money but won’t lead to long-term visitors and people sharing your work. I want to thank you for your other comment about affiliate programs. While affiliate marketing may die a slow death over the tax nexus laws, done ethically affiliate marketing could benefit many people. I once loved AdWords (but find it too dangerous to mess with now as a single-consultant person) and AdSense when well targeted could work and definitely works for those being paid for the clicks. What we really need is a social media site that is highly ethical. There is a new one about to launch that I sincerely hope may be what I’ve been waiting on. IMHO, the best way to make money for blogs is by reaching a specific geo-targeted audience. I explain that in the post I’ll put in CommentLuv in this reply. Sorry, it wasn’t before, but about two weeks later. This is a really great blog optimization resource and is seriously a HUGE pet peeve of mine. Smothering a site or blog in monetized insanity is something that will ensure I rarely if ever go back to a site again. I’ve included this resource in my latest blog post titled “Essential WordPress Installation, Optimization & Security Resources”. I consider this post a source of very sound advice and will share it wherever I can! Thanks, and keep up the killer resources! Thank you for your comment and the link and I apologize for the untimely reply. What I am doing takes more hours than I have available so I get around to everything as I can. With the number of blogs that have been having problems getting hacked lately now is a great time for me to share your security post again. I reviewed in on StumbleUpon and shared it before. I thinks different blogger do experiments with ads placement and type on there blog,which is some what necessary also.While posting ads to your blog you should always pay attention to your content visibility and readability because for that the only thing reader look for. This is a great list, because it’s a pretty comprehensive guide to the kinds of sites I never visit twice. I say, make people like being at your site, and they’ll support you willingly. Tricking them or inundating them in crap is never a way to win long-term. I too find the “You Have Won” type of ads very annoying and also those long big ads blocks in between posts very odd at times but I think ad blocks below title and below posts are completely Ok when it comes to readability for me. You are right, but if in order to make money you need your readers to click on ads, you just have almost no choice but to manipulate them to do so. We at http://www.publishedin.com believe there is better way for bloggers to monetize their content without ads at all. Bloggers continue write and link to products and services as they normally do. When visitors click a link, Publishedin reports a referral to businesses. Businesses reward bloggers through Publishedin Reward-Per-Click program. Businesses get connected automatically to all bloggers who have link to them. Businesses can start Reward-Per-Click program, promote their business, increase quality traffic and acquire new customers. It’s easy to make money with a blog that gets a ton of traffic. Sort of. As the saying goes, “Success hides a multitude of sins”. In other words, if you have traffic pouring in every day, it’s hard to not make some money. Unfortunately most bloggers are not in the “more traffic than I know what to do with” club. Do they not realise they are putting people off? The more I see website like that the less I look at them, I often do not even read the post to see if it is worthwhile as the ads have put me off. I have seen that ad too. It is really one of the most annoying things and nothing is more annoying than something popping up on my screen that I didn’t click on. You point of view is indeed right. I am not a blogger but I love reading blogs. It keeps me informed everyday. Anyway, everytime I encounter blogs with big Google Ads, I immediately close the blog site and never come back to it. What I feel about those sites is that, they do not have good topics and that they are using their blog mainly for money. Advertising play an important to increase the sell of the product.here this website shows the good example of advertisement.this shows a good marketing strategy. I never thought about the flashing banners being annoying, but it makes sense. I don’t like them myself when I’m trying to read a good article, so why put them on my own blog. Yep, you’ve pretty much mentioned the things that would turn me away from a blog. I don’t even wait around for a blog to finish loading if it starts to automatically talk or play music at me. First of all, it’s annoying. Secondly, I think it’s inconsiderate as in my case it can wake the baby. Agree with almost all of the post especially point #4. Let your readers get through a great post before slamming them with some big adsense ad. If they like your post they are more apt to click on the ad for more info or just to reward you for a great post. Great post. When I see Ad Sense plastered within the post I run for the hills. So tacky. I’m 100% agreement with point 3. Thanks. rodneyash would love you to read ..Our newest product offering NewHomeStepscom Launched today! Grate post. When I see Ad Sense plastered within the post I run for the hills. So tacky. I’m 100% agreement with point 3. Thanks. If you are advertising a poor product or business on your blog, it will reflect on your credibility. Yes I have seen those at several places i think they are not good and especially the pop ups are really ridiculous and totally annoying. Yeah! Sometimes a lot of people really make their site look like a thrash by inserting way too many advertisement. I laughed when I read this post.I agree with everything.Pop up adds have absolutely got to be the worst.To me nothing is more annoying than something popping up on my screen that I didn’t click on.If I am going to click on an add ill do it on my own accord.If I have to jump through hoops to get to your content Im not going to even bother. Good advice. I cannot stand flashing ads, I think it is so tacky. I used to have an ad block before my content but then I moved it after the content on my post and I have seen a measureable increase in clicks. I love this post and will be tweeting it out. You have started a great conversation here on monetizing sites. There is truly and art to it and much testing as well. The main thing folks should consider when they are looking to earn with online and affiliate marketing is what exactly it is they want their visitors to do once they get to their site. I have several sites and test them all for different outcomes. I totally agree with the adsense placements being in the right place for each type of site. If the site is a freebie type of deal, then yeah, toss the flashy banner adsense up in silly places. I know that the folks visiting a site of this nature just want to click on stuff… So I let them do what they want to do on the freebie site. The adsense ads actually bring in more revenue over all against the email and zip stuff. (CPA offers.) I am still trying to get a good handle on the CPA offers. On my information sites, I will not put adsense ads at all in most cases. The function of my really valuable and useful content is to monetize for opt-ins so I can follow up with my subscribers for things I know they are interested in. I do not ever use the drop down or pop up windows on my sites. TACKY.. I have found through testing that when I place an opt-in under my posts with video, as well as on my side bar, the conversion for verified subscribers doubles. The higher percentage of opt-ins are signing in under the posts verses the side panel. If I am looking to convert for an Affiliate product that is being offered, it is load and clear to my readers. I have personally made more mistakes than I can remember in the past. Why? because I got sucked in to the black hat idiots out there in my first few months of online marketing. I will not blame them though, I will only blame myself for being such a ding bat with it all back then. The best advise I could ever give anyone who is not making money or converting for opt-ins, is to walk away from looking at your site from a marketers eyes. Clear your head, stop thinking about the money for minute and revisit how your site looks to you if you were visiting it for the first time. If you second guess what you are putting on your site, chances are you should not put it there. Also, with affiliate products that are from CB possibly, ask yourself in all honesty if you would sell this product to your mother. CB has some awesome offerings, but you have to sift through the garbage to get to the goods. I agree with Michele from Newbizblogger. If you have your own information product, why would you give that lead to competitor? If it is a product that complements but not competes with you, your Golden!!! Sorry for the long winded comment but you got my attention and it is an important subject. Great comments from everyone here:) Thanks Growmap! I agree with absolutely everything you said. Not only will I not share blogs with ads like that, I often leave them quickly. We all want to make money, but our content is the most important thing on our blog and we should never get in the way of it. Personally, if i saw a big adsense ads block appeared everywhere on a site, i will choose to leave instantly. I do not think that a site that is purely for Adsense can provide me any valuable information. However, as a blogger, i also try to maximize my revenue from placing many ads block in my blog. I hope that this will not distract my readers. There is nothing more annoying that a pop up. I will never have them on my site, and I always leave if confronted by one. I also hate to have to scroll past inserted ads in the text of the page. It is disruptive. Do people really click on them? I find that hard to believe. Great post Gail. People really should think about the user experience when disrupting the reading of an article. Nothing is worse than flashing banner ads…to me, nothing discredits a site more than that. I know that is a false assumption, and people do it to make money, however it is quite a turn off for a visitor. The giant adsense blocks make me crazy too. One of my blogging friends switched to this method, and when I view their blog on my laptop the entire screen consists of ads and I need to scroll down to even start reading the post. I agree about the aweber list. I finally started to seriously pursue affiliate sales, and while it can take a while to set this up, especially if you want to write a review of the product to entice sales, it is worth it. Selling 2 products can well exceed the amount made from 1000 clicks to adsense ads, and once their on your list buys are the best prospects for future sales. Oh, if only wishing would make everyone heed this post. I’m still struggling with the right amount of advertising vs content. (Is there some magic ratio I’m not aware of?) But unless you have a super-popular site I think going light on the ads is probably the best policy. Never quite understood the adsense between your content. Why would you want to send your readers away for a few cents?? I honestly think Ad Sense takes away any sort of credibility from a blog / website. It always looks so clunky and awkward. Banner adverts from relevent products /companies / services not only look far better on the page but once in a while I do actually click and *shock horror* purchase a product through these. It’s so important to monetize in the right way. I too am sick of flashing banner ads and ‘you’ve won’ notifications. Yes some of y posts have affiliate links but only if they are directly related to what is being written. I am going to change some though so the links are at the end of the post. Its a good point about wanting them to read the whole post and then click the link. I don’t use adsense at the moment as I want to build more of a profile first rather than just another website with loads of ads! Some person wants to gain money with help of unofficial way.Internet is very god technology but some person misuse this..Nowadays SEO market arises.SEO is way to increase the traffic on search engines.Its occur in two way-Bad and Good way.Some person use this bad ways affect the user. “You have Won” ads are good way to lower trust from loyal visitors. I still don’t know why big websites still display such ads? I have noticed them often on AOL and such sites. For me, the jury is still out on monetized blogs. I don’t have any kind of advertising or so forth on mine, but then my blog isn’t about that. I would have thought there were channels where content could be published or syndicated for a greater and/or easier income. But then I haven’t investigated that, either! A lot of people with otherwise high-quality blogs are using lightboxes — a form of popup — to ask visitors to subscribe. I tweet their posts far less often because I’m concerned my Twitter followers dislike those as much as I do. I agree with you that many are very annoyed by those. I do not use pop-ups on any site I control and am so fast at closing those without reading them that they don’t work on me – other than to annoy me. They must work or they would have fallen out of favor by now; however, for every subscriber you get I wonder how many new readers you ran off? Yea I have found to keep away from Ad networks. I usually like the chance to pick and choose and not just get delivered ads. The good part is OpenX market let’s you specify which ads that can be showed. So you don’t have to worry about flashy or annoying “You’ve won” advertisements!! O’vey, I hate those types of advertisements myself!! Eventually I believe bloggers will only recommend what they actually use and love – even when we have to encourage those businesses over time until they finally realize the potential for advertising online. Most of the products and services I would move love to recommend would not have a clue what an affiliate program is or how to get one. When I click to a webpage, if it makes noise, whether talking ads, music, or some other thing, I leave and do not come back. If I cannot see the text for the ads, I leave, too. Too many other sites to check out to put up with that nonsense. Whenever you notice that I don’t answer right away it is because I have my speakers turned way down because the noise bothers others. I had them turned up when I went to that page and the ad was so loud I almost jumped out of my chair! From the first time Web sites long before blogs started putting music on their sites, wise people have advised not to have auto-play music or videos. I see many people still think they are a good idea and no doubt some will continue to recommend speaking pages. Personally, I don’t care for them either. I especially get angry when it is bigger and popular sites like CNET and they have an ad between and in all content and it is more prominently displayed that the actually meat of the matter. I also hate the pop-up boxes that scroll with you so you can see the content without clicking on them… also, the pop-out sidebars that take up a whole page. Yea, making money is something you gotta do, but its unfortunate that it dominates the scene sometime. The big sites are also more likely to split an article into four parts so they can fit in more ad impressions. You may want to read my post about KeywordLuv because it allows you to turn your blog comments into incoming links to benefit your Web site. I heard from one SEO marketer that putting your content under ads or non-content like material takes a long time for the google bots to crawl your page. So if they crawl and crawl and crawl and don’t quite get to the content, the bots might just move off and not even bother with the ranking. That is very likely true as well and yet another reason not to position ads that way. That flashing banner ad isn’t from google and it plays sound. Super yucky. The “ads by google” text is for the text links under it. That is good news. Yes, that is “super yucky”. Thank you for the plugin – I would be going bonkers now without it and I suspect it wouldn’t exist if it weren’t for you. I totally agree with you, especially when there are ads after a posts title. If I see that sometimes I will not read the post. I’m sure that others do that too because their first impression is that blog only exists to display ads and they don’t expect quality content there. Sometimes there is but much of the time there are only average PLR articles on that type of site. Amen! The one that bothers me the most lately, is the popup ad that hits right when you get to the page … before you ever read the content or see the page, you get hammered. I hit the back button every time. I totally agree with you. Even popup subscription boxes annoy many readers. I know they work but I am not sure how many they readers they run off versus how many subscribe. No popup is as annoying as that “You have won” audio flashing awful ad I got on that site the first time I loaded the page. I wish I had done a screen capture of it. Are you commenting on blogs in your niche? Visit Good Millwork’s DoFollow CommentLuv KeywordLuv home improvement blog and consider joining our private blog collaboration. (Details in the post in CommentLuv in this reply. You will also want to read my post about how to use KeywordLuv because you can get valuable incoming links for your site by using it here and there and in many other blogs. I added keywords for you in your comment. I saw one recently with an ad that had sound playing on a loop that wouldn’t shut up so I could watch the video on the page. And when I tried to get rid of it with an ad blocker, it disabled the custom video player. Many people don’t seem to realize they need to test what they create. That is another benefit of belonging to a blogging community. We regularly let each other know directly when links are broken or there are other issues like that one. There are still Internet users who can not play video or have strict download limits (which are going to be more common as wireless phone ISPs do limit how much you can download). Any site that has something that keeps downloading over and over (rather than playing a loop of what has already been downloaded) is going to cause users problems. HughesNet limits are so bad that even when I paid $140/mo. for their pro package I hit the limit even though I never downloaded or watched any videos ever. Gail, I use WildBlue satellite service, so I hear you on the video issue. However, I think the service is much better HughesNet in terms of speed and allowed bandwidth. Might be worth switching. Thanks for the tip. Fortunately, Wi-Five has wireless Internet service Dallas metro area. If I still had to put up with terrible HughesNet it would make me crazy. I was stuck paying it out and use it for backup – at twice what my wireless costs and unusuable even when I tried upgrading to their $140+ Pro version. Now that it is paid off I may find a different back-up service. I wonder if WildBlue uses Hughes HN9000 equipment? I tried calling Earthlink but I got a customer service person who was incapable of understanding why I did not want to buy more equipment when I already own what they use. You may want to consider something like Clear wireless 4G service. You can get up to 6mbps speeds for $30 per month and it is available in the Dallas metro as well. I have seen that ad too. So true! If you offer a professional service, you simply cannot afford to have a blog that’s cluttered with ads all over the place. Besides, why would you want to do this? You make a few pennies from Adsense but a good client will be worth thousands of dollars. It’s the content of your blog posts that creates marketing traction. Businesses especially need to avoid sending their potential clients away. I have been advising ecommerce stores to remove AdSense ads for many years now. Usually it is niche bloggers who use these kinds of monetization tactics and I personally believe they are bad for ANY blogger.